In a previous article, “Work Space and Office Creativity: Does Size Really Count?“, I argued that, contrary to research suggesting the size of a workplace space directly correlates with creative performance, it may count less as an influence on creativity than the quality of the space, including whether its boundaries and partitions create a sense of isolation or suffocation, privacy or teamwork. Now, I want to consider, apart from benefits and costs of workspace size, the motivations and other causes of size preferences, irrespective of how those preferences actually directly impact work performance. Knowing why an employee prefers a larger or a smaller space can provide valuable clues to other aspects of his or her personality, character, work perceptions and work style that independently of space can impact job role and performance. Territoriality: When a staff member wants and gets a big office, we instinctively understand that this means power—both as a goal and as an outcome. But why is that? A close look at how the territorial instinct in other species works provides an answer: Acquisition and retention of prime turf and territory, including nests and nesting sites, are well-documented motivators—indeed, often blind instincts—underlying animal (including human) invasion, occupation, exploitation and defense of a space. Recall Hitler’s Lebensraum—”living space” expansionist obsession, as a rationale for territorial invasion and conquest. It is also well-known that in confrontations between otherwise well-matched adversaries (which was not the case with Nazi Germany vs. Poland in 1939) those occupying a territory are likely to have the edge in confrontations over it, if only because, in the animal kingdom, prime territories offer the best food sources, shelter, building materials, etc., that promote strength, vigor and vitality critical to competition, confrontation and continuation of the blood line. However, on top of that, there is the curious, but compelling logic that explains why a resident territory occupier and defender—a black widow spider, for example, like the one shown here, will have the advantage when challenged by otherwise competitively nearly indistinguishable intruders of her or his own species. 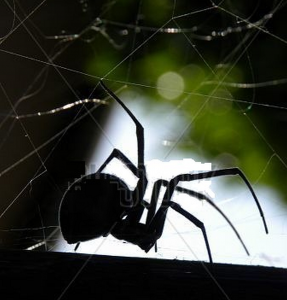 The gist is this: If the intruder were to somehow generally have the edge, resident spiders would generally be forced to flee, thereby disrupting their entire life cycle, including breeding and feeding, forcing them to yield, vacate and themselves adopt the role of an intruder rather than breeder. As a result, being a resident would be inherently unstable as a life strategy and too brief to permit successful breeding competition with intruders, who themselves, once residents, would be forced to vacate the territory upon the arrival of another intruder, thereby jeopardizing their own reproductive survival, and by implication, of their entire species. Presumably, species of spiders that over the course of evolution opted for flight rather than fight in defense of a territory proved to be unsuccessful with limited or zero long-term reproductive survival prospects. This means that even if intruders were in some respect superior adversaries and always or generally triumphed, thereby outbreeding the displaced residents, once they dominated the population gene pool, resident flight would become the norm, with all of the unfavorable consequences for reproduction mentioned above, regardless or indeed because of the superior gene-controlled invader behavior. The implication for the human workplace is that if some form of territorial drive underlies a staffer’s preference for a space that is not just big, but also bigger and better than that of others, (s)he probably sees himself or herself as a force to be reckoned with and not resisted, and fully capable of defense against any challenges. If the analogy with spider resident-edge logic holds, (s)he will probably be right. Buffer: In some instances, an employee’s preference for a big workspace may be a marker and motivator for the exact opposite of the territorial alpha-(fe)male staffer’s or boss’s power ambitions. Rather than having a self-perception as an irresistible, superior force, the buffer-seeker may feel vulnerable and insecure and therefore want more space and distance from in-house threats. On one interpretation, Russia’s desire to keep Ukraine out of a NATO quilt may be a manifestation of a desire for such a geo-political buffer (between itself and arch-invader Germany), rather than evidence of expansionist, overweening territorial ambition. Hence, in the workplace, a strongly expressed preference or drive for a big(ger) or at least well-partitioned office may indicate a very defensive posture and objectives, rather than anything self-aggrandizing—with obvious implications regarding the likely course of in-house relationships and maneuverings. Convenience: I prefer small spaces—both personal and work space. By this I mean a preference for a smaller rather than larger total floor space and also for a single smaller space rather than a larger compartmentalized partitioned space, e.g., a 250 square-foot A-frame cottage, in preference to an 800 square-foot 1-bedroom condo with several rooms. Likewise, I prefer a workspace with only one smaller room over one with two rooms, irrespective of their size. One reason for this across-the-board preference is convenience. Because everything is in one compact space, fetching needed items is much easier. I have never been able to fathom the appeal of a 10,000 square-foot Hollywood mansion, given the required traipsing about looking for car keys or the book put down somewhere—unless I also had servants tasked with that (if I were sure which rooms they are in and didn’t have to look for them as well). It’s ditto for the workspace; by definition a separate room is one out of sight, unless all walls are glass, which means it cannot be scanned and must therefore be searched for desired items. No thanks. I like the panopticon features and convenience of a single smaller, cozier room. As a corollary to territoriality, such gigantomania—obsession with bigness (including big muscles and breasts, gigantic HDTV screens, monster trucks, SUVs and Great Danes)—seems to value bigness as an end in itself (although in fact usually tied in with cravings for power, safety, status, etc.). Accordingly, an employee or boss who insists on having a very big, if not the biggest office, may simply be afflicted with gigantomania—in the form of a culturally-fueled and structured desire for big space with big windows and a big desk, just because it is the American Way, rather than because of or in addition to some insecurity or arrogance. Integration vs. Compartmentalization: As I see it, a single smaller space offers greater ease of integration of all functional aspects of the space, be it personal or work space. Rather than being like an aggregate of contiguous cells (in the form of multiple rooms) or a single large cell (like an ostrich egg), the smaller single-unit space makes the integration of all functions visibly and logistically obvious, e.g., using a bed as a work and rest place or dinner table as a desk, with easy segues from one function to another. Larger and/or partitioned spaces don’t offer that. Historically, the creation of and preference for functionally separate and therefore larger spaces was favored by the ruling class, be they aristocracies, warrior or wealthy merchant or landowning classes—mostly for the buffering purposes of privacy, safety and perpetuation of their mystique (as a peasant control technique). It is, I suggest, therefore quite likely that such functional separation of the sort typical of Hollywood A-list stars and Silicon Valley titan mansions. e.g., into den, solarium, rec room, sauna, music room, studio, stable and the like, is inspired by the status and cachet of such privileged antecedents, much as the chic and form of the popular sports jacket derived from the hunting apparel of landed gentry. Manifestations of snobbery-motivated functional separation and demarcation of work space won’t be hard to find, even if harder to justify than truly functional “functional” workspace compartmentalization of the kinds found in a factory or lab. So, when dealing with personnel, designers or bosses who favor or propose multiple single-function spaces, it is important to ask whether or not the resulting design and allocation of the space is about actual utility or mere vanity. …while making some space for expanded self-understanding.